Leviim – Looking Forward to Zimriyah and Other Great Activities! We’ve been having a fantastic week here at Machaneh Yavneh! On M onday, we began learning some of our Zimriyah songs. It is genuinely amazing how quickly our chanichim (campers) can learn three songs, entirely in Hebrew, and be ready to perform them in front of the whole camp. Our Zimriyah practices have been going swimmingly and our chanichim are extremely excited about what’s in store for next Thursday night. On Monday evening, the Kerem (CITs) for our bunks ran peulot erev (evening activities) for us. The boys competed in an everything bracket, won by Sam Levitt, and the girls put on some hilarious skits making fun of things in camp. 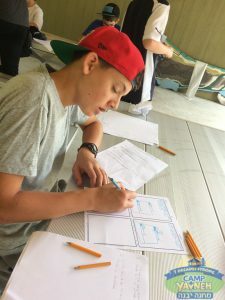 On Tuesday, the banim (boys) got a chance to work on their cartooning with Jordan Gorfinkel, a professional cartoonist. We made comics about things going on in camp and stories from the Torah. At night, we had one of the most fun peulot erev I’ve ever been a part of. All of our chanichim dressed up as seniors for our Erev Senior Cruise. First, they boarded the ship to receive complimentary glasses of sparkling cider. Then, we moved on to our Jazzercise class and shuffleboard tournament. The evening ended in a rousing game of bingo before we gave our seniors prune juice with their medications (just some mike and ikes that look vaguely like pills). 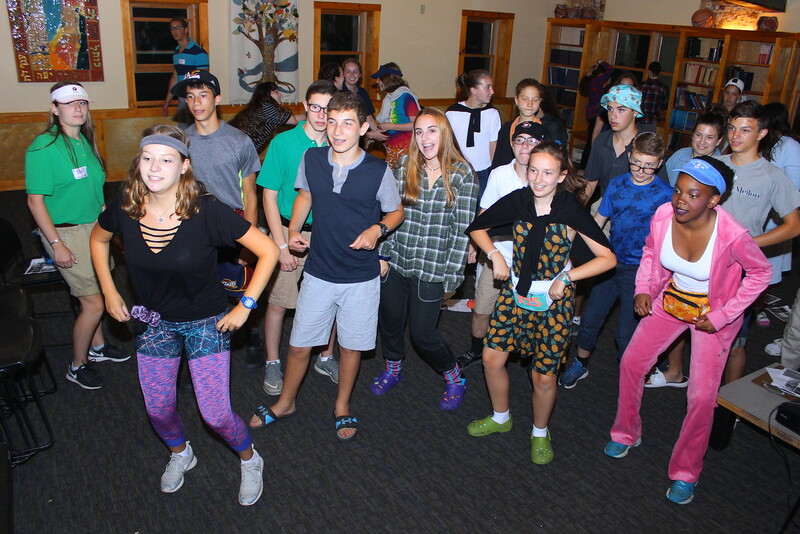 As absurd as this may sound, all of our chanichim were extremely into the peulah (activity), and it was awesome. Yesterday, we woke up late for a chance to head to the ocean! Hampton Beach State Park to be exact. It started out cloudy but the sun soon broke through for a lovely day at the beach. 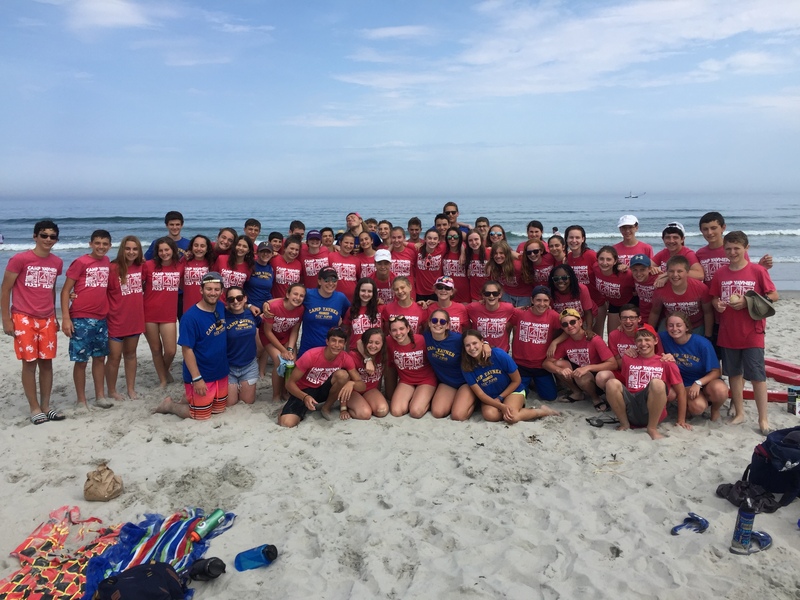 Our chanichim played in the waves, threw frisbees, and played spikeball. Later on we got ice cream for everyone before heading back to camp for a long shower time. Last night, we had our Hawaiian Luau with Arayot (campers going into 8th grade). 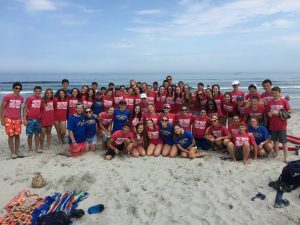 There were various beach-themed activities and decoration, and our campers had a lovely time. That’s it for this week! Shabbat is fast approaching, finally a chance for all of us to get some rest from what has been a very busy week here in Leviim.